Who else hates airplane food? Assuming that’s just about everybody, allow us to offer up a better alternative. Lately when flying, we’ve been craving big, hearty salads. Bonus: They’re easy to pack to go for travel! 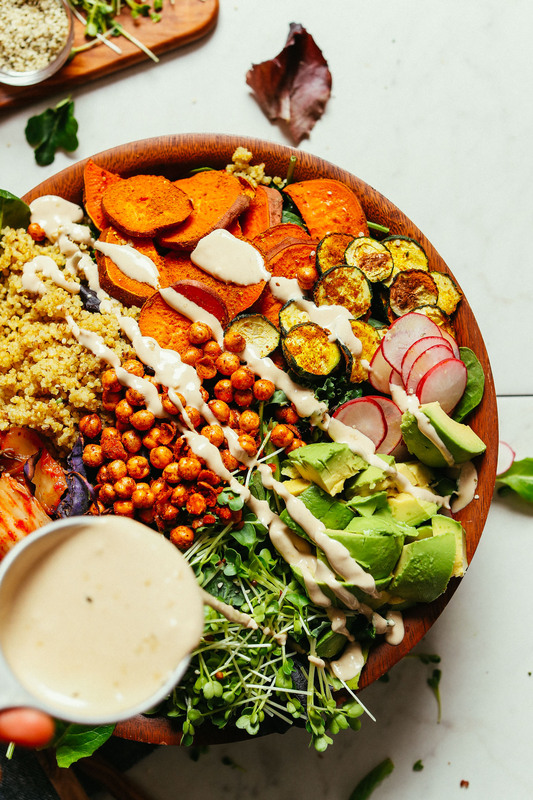 This 30-minute salad is customizable and insanely satisfying, and it features my NEW favorite savory tahini dressing! Let’s do this! This salad starts with roasted vegetables, which we love adding to salads for extra flavor and heartiness. You can choose your favorites. We went with sweet potato, cabbage, and zucchini. 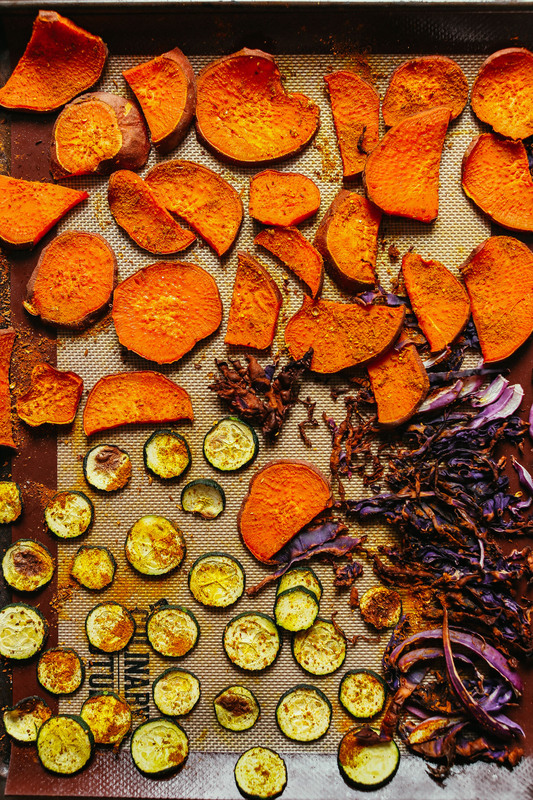 You can even keep them oil-free by following this Oil-Free Roasted Vegetable recipe. The dressing is kind of the star of the show. It starts with tahini and is flavored with fresh garlic, garlic powder, a pinch of sea salt, and coconut aminos. The result is a creamy, luxurious, savory dressing that pairs perfectly with the flavors in this salad (and just about every other salad, for that matter). All that’s left do to is choose your additional toppings, such as kimchi, quinoa, crispy chickpeas, or sprouts! And don’t forget the avocado – always avocado. This would make the perfect weeknight meal or side when you need something on the table fast. As we mentioned before, it would also pack up nicely to take along on road trips or flights (we just keep it refrigerated as long as possible and then eat it as soon as the plane takes off for freshness). 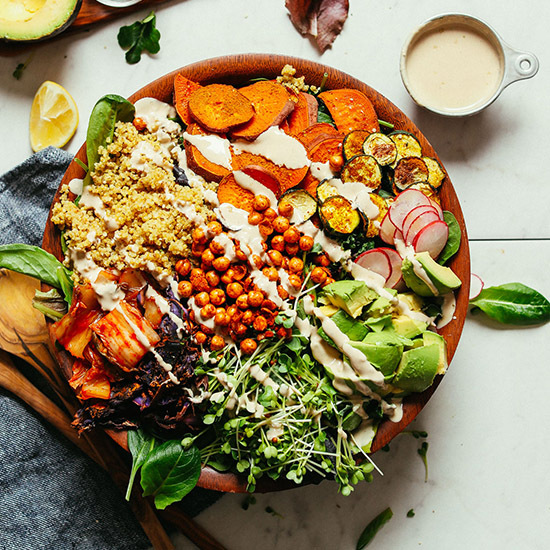 This salad would pair well with my Romesco Soup with Smashed Chickpeas, Sweet Potato Black Bean Burgers, Rich Red Curry with Roasted Vegetables, 1-Pot Everyday Lentil Soup, or Vegan Pumpkin Mac ‘n’ Cheese! If you try this recipe, let us know! Leave a comment, rate it, and don’t forget to tag a photo #minimalistbaker on Instagram so we can see what you come up with. Cheers, friends! An abundant kale salad with roasted sweet potato, zucchini, avocado, sprouts, crispy chickpeas, and kimchi! Topped with a savory tahini dressing, this salad makes the perfect 30-minute meal or side. If serving with quinoa or crispy chickpeas, prepare at this time (follow links / see notes for instructions). Otherwise, proceed to step 2. Preheat oven to 375 degrees F (190 C) and arrange zucchini, cabbage, and sweet potatoes on baking sheet. Drizzle with coconut oil (or sub oil-free options), sea salt, and curry powder and toss to combine. Roast for 20 minutes or until tender and slightly golden brown. 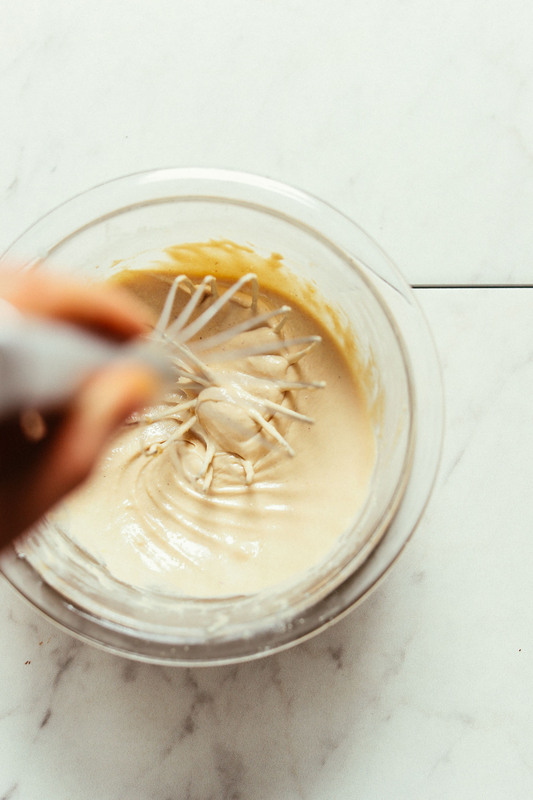 In the meantime, prepare dressing by adding tahini, garlic powder, coconut aminos, sea salt, and garlic to a small mixing bowl and whisking to combine. Then add enough water to thin until pourable and whisk until smooth. Taste and adjust seasonings as needed, adding more garlic powder for garlic flavor, coconut aminos for depth of flavor, or salt for saltiness. Set aside. 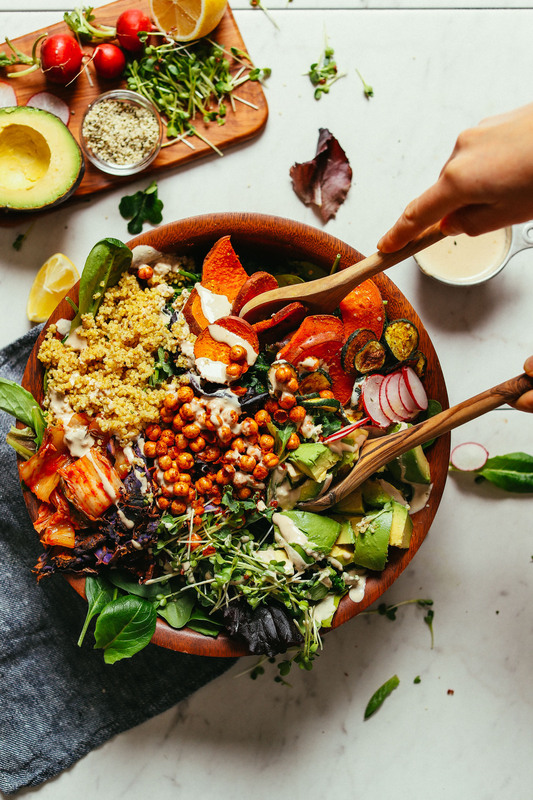 Assemble salad by adding greens, radishes, hemp seeds, and avocado to a large mixing bowl. Add the lemon juice (or apple cider vinegar) and gently toss to combine. Add roasted vegetables and any other desired toppings (quinoa, chickpeas, etc.) and serve with dressing. Best when fresh, though leftovers keep well stored in the refrigerator up to 3 days. Dressing stored separately will keep for 7 days. Chickpeas should be stored separately at room temperature to maintain crispiness. *To prepare quinoa, add 1 cup (184 g) quinoa, a pinch of salt, and 1/2 tsp curry powder (optional) to a small saucepan over medium heat. Toast for a few minutes, stirring occasionally. Then add 1 3/4 cups (420 ml) water and bring to a boil. Once boiling, reduce heat to low and simmer covered for 18 minutes or until all water is absorbed. Remove from heat and let cool (uncovered) until serving. *Nutrition information is a rough estimate for 1 of 4 servings with all of dressing, with oil, and without optional toppings (quinoa, chickpeas, etc. ).